The origins of the Basque people and language are in dispute. In fact, according to some conventional theories, the ancestors of the Basques are the ones who repopulated much of Western Europe after the last Ice Age. The story goes something like this. 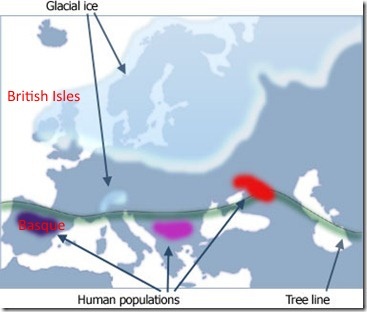 During the last Ice Age about 25,000 years ago, the surviving prehistoric inhabitants of Europe were forced to migrate south to warmer climes. They ended up – you guessed it – in the area now occupied by the Basque Country. This pocket of hearty survivors is known as the Basque refuge (the politically correct term is Iberian refuge). Then, about 15,000 years ago, as the ice and glaciers receded, this population migrated north again to repopulate parts of Europe. How do we know this? Because modern genetics tells us so. 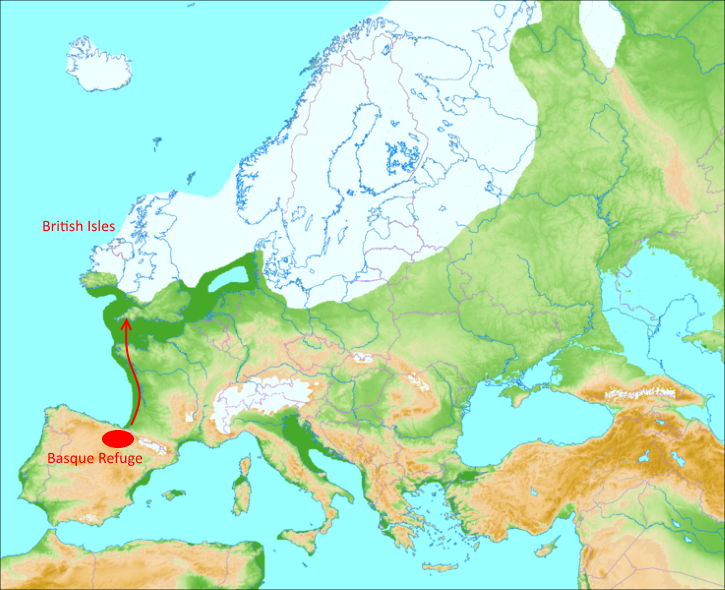 Genetic studies show that the paternal genes of today’s Basque population (known technically as the R1b haplogroup for those scoring at home) are the source for many of the genes found throughout Western Europe and especially in the British Isles. That the Basques, and more generally the Spaniards, are the earliest ancestors of the British people has resulted, as you might imagine, in quite a bit of controversy (recent genetic studies assert – perhaps with some political influence – that the British and the Basques technically descend from the same common ancestor, rather than the British descending directly from the Basques). But the ancient trail of genetic breadcrumbs that flows from the Basque Country to the western British Isles – Cornwall, Wales, Scotland – is indisputable. The geographic “evidence” also supports this – even as the last ice age receded, ocean water was still locked up in glaciers, resulting in lower sea levels. What are now the British Isles were connected by land to mainland Europe. Those earliest of explorers would have left the Basque refuge and simply followed the coastline to what is now Wales and Scotland and from there to the rest of Britain. Other bands of explorers would have headed north into France and Germany. And if you’re wondering about the Angles and Saxons – those prehistoric tribes who were for many centuries considered the original inhabitants of Britain – the genetic trail shows that they showed up later, having come from a different Ice Age refuge in what is now the Balkans. Needless to say, the volatile mixture of race, language, culture and nationality in Europe has been the source of some of history’s greatest conflicts. The Basque people and nation are no exception. From the earliest recorded history starting with the Roman occupation all the way through the recent dictatorship of Francisco Franco, the Basques have been the subject of persecution. This has resulted in a people and culture that is fiercely independent and proud. There is a sense of place and identity in the Basque Country that is palpable to anyone who visits. And it’s this sense of place and identity, this sense of exceptionalism, which infuses all areas of the Basque culture, from literature to politics to art and even to gastronomy. Officially, the bombs stopped exploding in 2011. That October, the Basque separatist group ETA (acronym for Euskadi Ta Askatasuna or “Basque Homeland and Freedom”) declared a cease fire in its attempts to gain independence, or at least further autonomy, on behalf of the Basque people from what it considered the oppression of the Spanish government. Throughout the eighties and nineties, the ETA’s violent campaign against the Spanish authorities barely merited a mention in US media – the contemporary violence in Northern Ireland commanded far more attention stateside. 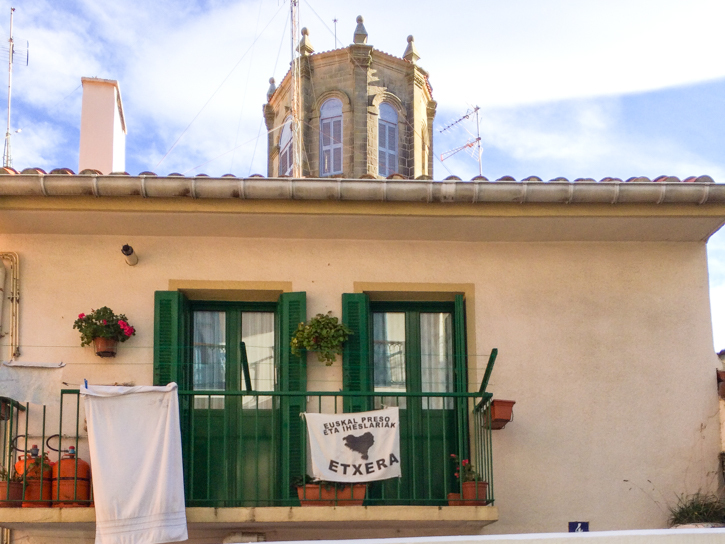 The impact of the ETA’s campaign of violence on tourism in the Basque country is debatable. Europeans certainly flocked to San Sebastian throughout the violence, and American movie stars had no qualms about visiting during the yearly San Sebastian Film Festival. Still, the occasional (sometimes sensationalized) reports of bombings and assassinations in the Basque Country at least created a significant public relations problem and dampened any attempts at tourist marketing (culinary or otherwise), especially in the United States. And although there have been cease fires before, the 2011 cease fire seems permanent, guaranteed by a 9/11-inspired, European Union-wide crackdown on all forms of terrorism as well as a Spanish and Basque citizenry with little tolerance for violence after the 2004 Madrid train bombings (unrelated to the ETA). Additionally, the creation of the current Spanish democratic state after decades of dictatorship under Franco resulted in the Basque Country emerging as one of the most politically autonomous regions of any European country. Legitimate and trusted political channels between Spain and the Basques were established to deal with disputes. The threat of bombings and kidnappings was superseded by more peaceful methods. Now removed from the stigma of violence, the Basque sense of culture and identity continues to flourish, expanding internationally, ushered forth in no small part by the culinary wizardry and marketing genius of its Michelin-starred chefs and a citizenry with an extraordinary appetite for only the best food and wine.